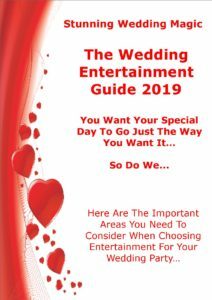 If you want to ensure that your wedding day guests are thoroughly entertained and remember your special day forever, Clive Hyams can help. A magician with many years’ experience in performing in front of audiences, Clive will keep your wedding guests entranced with his close-up magic silky skills and his fast, witty persona. Clive, You didn’t disappoint at our wedding yesterday. After being dumbfounded by your magical skill at a friends wedding, you were the only person we wanted to entertain our closest friends and family on our special day. You certainly left an impression with everyone, young and old. Thank you so much, for travelling so far, being 100% committed to what you do, staying so enthusiastic from the first minute to the last and for staying on so late into the night, despite your long journey. I hope I have the opportunity to see you in action again in the future. As you’ll see from his testimonials, Clive’s magic is so mesmerising and entertaining that party guests rave about it. They love his sense of humour, just as your guests will too. Awesome! Clive made the party extra magical: magic just happened throughout the party; he totally and seamlessly integrated himself into the evening’s proceedings with children and grown-ups alike mesmerised, engaged and entertained. You can book Clive to perform at your wedding with complete peace of mind because he offers a 100% satisfaction guarantee. That means you only pay him if you’re completely thrilled with the entertainment he provides. Wedding parties can be very expensive. The average cost of a wedding in the UK is now about £25,000, according to Wedding Magazine. And it’s a lot higher if you’re living in the capital. Harper’s Bazaar reports the average cost of a London wedding is an eye-watering £38,000 and that 4% of couples spend more than £100,000. But your wedding party doesn’t have to break the bank—if you’d like to save thousands of pounds on the cost of your wedding, Clive can help. To find out how Clive can make your wedding day magic and save you money, call him now on Freephone 0800 018 8118 or Telephone 01737 350586 or contact him here. 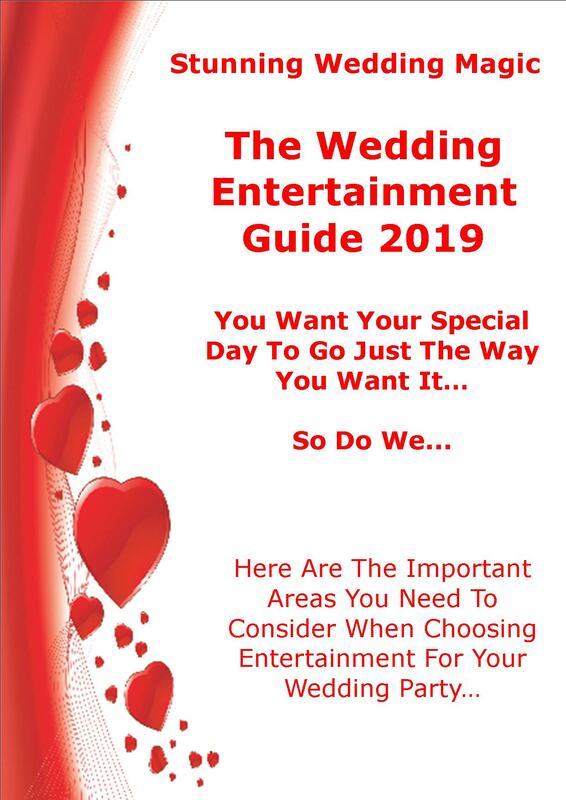 This book is stuffed full of ideas, tips, suggestions, and advice to help you arrange the perfect entertainment for your wedding party. Have you ever thought “What questions do I need to ask the band or DJ?” or “What else can a magician do for us?” or “How can I arrange a DJ who will be right for us and our party?” or “What other sorts of entertainment works at weddings?” These and dozens of other questions are answered. In short, we have done lots of the thinking for you. Best of all the book is completely free, we’ll even pay the postage for you. To get the ball rolling simply fill the little form on the top right of this page and we will be onto it straight away. If you are viewing this on a mobile telephone, then the form is at the bottom of the page. N.B. We promise NEVER to share your details with any third party ever, we hate spam Email too.